Let's be honest, folks: The most exciting part of the MTV Video Music Awards isn't seeing your favorite artist receive acknowledgment for their work — it's getting a front row seat to all the live drama that goes down when hundreds of celebrities are in the same building together surrounded by cameras. This year, 2018's "it" couple, Kylie Jenner and Travis Scott, made an appearance at the VMAs. From music to makeup, from fashion to finance, there are few major industries that haven't been infiltrated by these two. Recently, we got a closer look at Kylie and Travis' relationship when the couple played "23 Questions" for GQ. 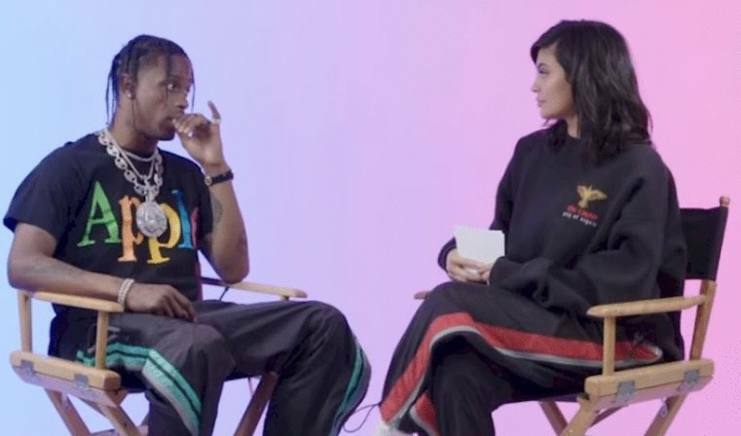 Kylie quizzed Travis on various aspects of her life, including her family, tattoos, and makeup routine. And, well, sorry to say, but Travis Scott kinda failed miserably. For example, Travis couldn't even name all four of Kylie's dogs — sure, that's a lot of dogs to begin with, but come on, it's been over a year and they have a child together. 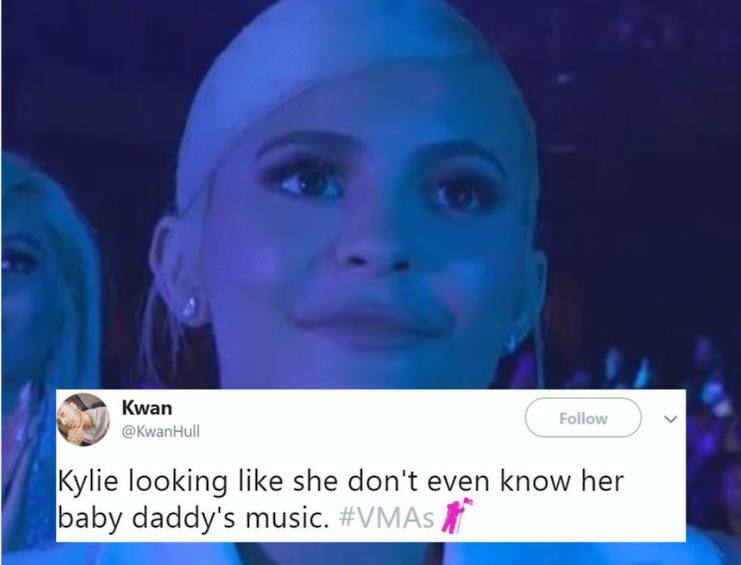 However, after this year's VMAs, people are beginning to question just how well Kylie knows Travis. Travis took to the VMAs stage to perform a mix of tracks off his latest album, Astroworld. Kylie Jenner looks like a mother who, after asking to hear some of that rap music her teenage son likes, is immediately regretting it. And here, I've put together a few images to show you just how much Kylie danced during Travis' performance. As you can see, there's basically no movement happening besides the slightest of sways, which merely informs me that Kylie could at least hear Travis' performance. People were hoping for a lot more than a neutral expression and acknowledging sway from Kylie. Imagine if your boyfriend and father of your child was performing music from a brand-new album — which just earned its second week at #1 on the Billboard charts — in front of millions of viewers. Wouldn't you be a bit more excited? Instead, Kylie gave us the blankest of blank stares. Seriously, what happened? Did Kylie and Travis get into a huge fight just before he went onstage? Because she kind of looks like she wants to murder him. Overall, it was a pretty awkward scene to witness. Something just felt off about the situation. Maybe it was because Kylie and Travis had just been dragged into a big Twitter feud with Nicki Minaj. However it happened, Travis and Kylie were definitely not seated anywhere near Nicki Minaj by the time the show aired. Who knows? Maybe it's just been a dramatic few days for Kylie and she wasn't in the mood to get rowdy during Travis' performance. Whatever the reason, it made for a pretty awkward VMAs moment.